20 clubs and schools took part in the Ladies Gaelic Football Association's very first Lá Náisiúnta Blitz na gClub Gaeltachta, in association with championship sponsors TG4. On Easter Monday (April 2), Lá Náisiúnta Blitz na gClub Gaeltachta saw U12 girls played a series of non-competitive games at Croke Park, while also getting the opportunity to mingle with some of Ladies Football's leading stars. Dublin's Sinéad Finnegan, Sinead Goldrick, Éabha Rutledge, Muireann Ní Scanaill, Martha Byrne and Niamh Collins were all present to deliver talks 'as gaeilge' to interested young players, along with Meath ace Vikki Wall and Aisling Byrne from Laois. Lá Náisiúnta Blitz na gClub Gaeltachta was part of the LGFA's ongoing initiatives to celebrate Bliain na Gaeilge. Clubs and schools from Kerry, Galway, Mayo, Donegal, Cork, Dublin and Kildare braved the weather conditions to produce some sparkling football on the day. The LGFA's official retail partner and National League sponsor Lidl was also on hand to provide lunches to the various teams, while the players received LGFA goody bags on departure. Lidl also assisted with the coordination of the day through the provision of mentor bibs and the presence of Lidl ambassadors. LGFA CEO Helen O'Rourke commented: "This was a hugely memorable day for the 20 clubs and schools with Irish-speaking backgrounds, who were present at Croke Park as part of our ongoing efforts to mark Bliain na Gaeilge. "This was yet another exciting initiative for our Association and it was heartwarming to see the players enjoy their day out at Croke Park. "Despite the rain, the teams produced some wonderful football and judging by the talent on show, this won't be the last time that we'll see many of them playing at Croke Park. "I'd like to acknowledge the continued support of our championship sponsors, TG4, and the support provided on the day by Lidl. "I'd also like to credit the outstanding work carried out by members of the LGFA development team in the organisation of this special day, and a word of thanks also to the mentors of the various teams. "The ongoing celebrations of Bliain na Gaeilge are very important to us and this unique event at Croke Park celebrated the Irish language through the medium of Ladies Gaelic Football." TG4 Head of Sport Rónán Ó Coistealbha commented: "TG4 are very proud to be associated with this initiative with the LGFA. 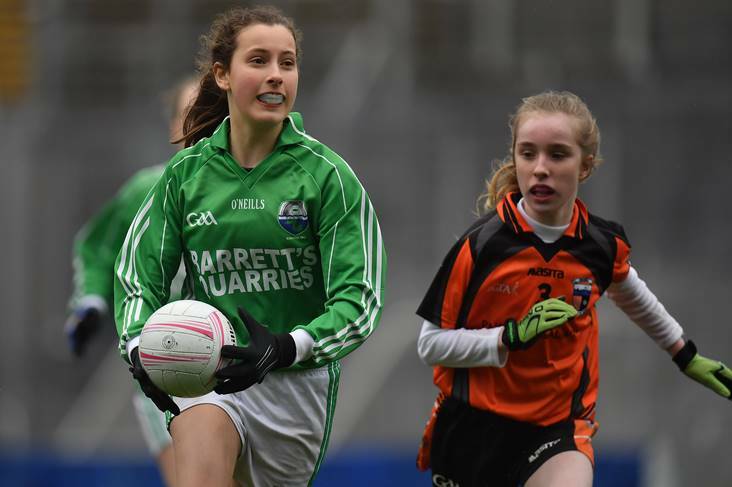 "2018 is Bliain na Gaeilge and this Blitz was a fantastic opportunity for young girls representing Gaeltacht Clubs from all over the country to grace the hollowed turf of Croke Park, speaking the Irish Language." "We are proud of TG4's sponsorship and broadcasting of Ladies Gaelic Football since 2001 and we have another exciting year ahead of us with the upcoming Lidl League Finals and the TG4 Championships."